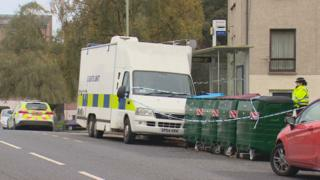 Detectives say they have begun a murder investigation following the death of a man in a block of flats near Dundee. Mark Johnston, 53, was found dead in a flat on Nursery Road, Broughty Ferry, at about 21:50 on Friday. Police Scotland said a 44-year-old man had been arrested in connection with the incident. The man was taken into custody and has now been transferred to hospital for "ongoing treatment and assessment". Det Insp Tom Leonard, who is leading the inquiry, said: "My condolences are with the family and friends of Mark Johnston, and they continue to be supported by specially-trained officers following his tragic death. He added: "Officers will remain in the Nursery Road area over the coming days as we continue our murder inquiry and to offer support and assistance to people in the neighbourhood. "I would like to thank residents for their help - this is a quiet area and the community has been understandably shocked by what has happened. I would emphasise that this is a very unusual incident which poses no risk to others."